Blizzard’s Firebird WRC is the single best carving ski we have ever tested. Period. Beginning of the new carving story. Our testers came off the hill talking about how this ski (along with the Fischer Curv, Atomic X9 Redster, Nordica, etc.) 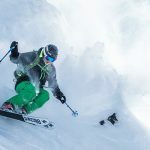 could very well signal a new era in pure frontside rippers, where every lift-served skier will be adding a pure carver to the quiver, much in the same way that they already have a dedicated powder ski. The magic in the chassis of this brand new full-on road ripper is Blizzard’s new twin carbon technologies. Dubbed C-Spine and C-Armor, the former features two bi-directional carbon fiber layers in the middle, running tip to tail for rebound and response, while the latter runs edge to edge under the binding, for power and hold. Along with two layers of Titanal, it results in an unshakeably precise, unbelievably fun ski. This is the top model in what is a whole new line of hard-arcing carvers for Blizzard. 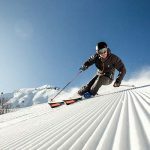 And its stability, ease-of-use, and uncanny ability to make carving hardpack seem like the most wonderful thing you could ever do a ski day, truly has reshaped this ski category. The ski earned high marks across the board in every classification, with 10s out of a possible 10 in every score column on some testers sheets, and nothing lower than an 8 from anybody. The Firebird WRC is one of the highest scoring skis we have ever tested. If you like carving, you are going to love this ski. As noted in the full review, the majority of our test team gave the Blizzard WRC 10s or 9s in the Overall Classification, noting how well it performed in every parameter of their testing protocol, and also in reference to how well it performed in regards to the other Carving skis. “This ski has the widest performance window in the class,” one tester wrote, adding that, “It defines the Carving Category.” Another wrote, “I would own this ski and use it 90 percent of the time if I was skiing out East. 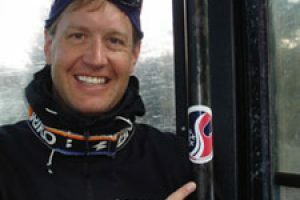 It is a smile inducer.” The Firebird did not garner any score lower than an 8 in any single classification, with the only reported ‘knocks’ against it being that it may not perform as well in shorter turns, and that it is not an intermediate or less technical skier’s ski, which actually reflects what we found about most of the skis in this category. Superior stability equals superior fun, especially at higher speeds. And the faster we went on the Firebird WRC, the more fun we had. Two key additions to Blizzard’s new dual carbon technologies are a twin Titanal sandwich for additional dampening and power, and a compound sidewall construction for balanced, exceptionally even flex and predictability. Again, this classification saw the Firebird earn plenty of 10s and 9s, and no lower than a couple 8s across the board. Sixty percent of our test team gave the Firebird a perfect 10 in the Carving Pleasure classification—the ultimate compliment in the Carving Category. The other testers gave it 8s and 9s. Sometimes we get a little too impressed with power and stability when testing these skis, when what we are really evaluating is just how great each deep arc feels. When it comes to the pure thrill of actual carving, the Firebird delivers that thrill from the top to the bottom of the hill. As mentioned above, a couple testers did not feel the Firebird WRC was as accurate—or more likely, as effortless—at making shorter swing turns. The majority of other testers reported that it easily did it all. 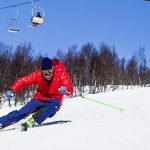 This was certainly the most versatile ski we rode in the Carving class, with so much performance that it will appeal to a wide range of frontside skiers looking for a go-to ski for groomed and hard snow.